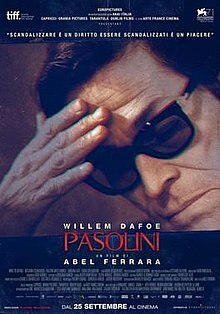 Pasolini is a 2014 English-language Franco-Italian drama film directed by Abel Ferrara and written by Maurizio Braucci about the final days of Italian film director Pier Paolo Pasolini. It was selected to compete for the Golden Lion at the 71st Venice International Film Festival. It was also screened in the Special Presentations section of the 2014 Toronto International Film Festival. Pier Paolo Pasolini (Willem Dafoe) is fifty, and lives in the rowdy Rome of the 1970s. He has just finished shooting his latest film Salò, or the 120 Days of Sodom, a film that has shocked both critics and audiences. Pasolini is increasingly opposed by the people, critics and politicians, both for his homosexuality, and because he is considered impulsive and scandalous in showing his reality to the public. Pasolini is going to shoot a new film (which was never made), in which he cast Ninetto Davoli as the famous Italian actor Eduardo De Filippo and Riccardo Scamarcio as the young Ninetto Davoli - with whom he has a special relationship. While Pasolini is working on the film, his mother (Adriana Asti) and his sister try to dissuade him from the project, because it would be too wild and visionary for the Italian public to accept. Pasolini continues with his work, missing many interviews with journalists. He begins a relationship with a boy from the suburbs of Rome, Pino Pelosi, and takes him to a restaurant in the seaside village of Ostia. Pasolini wants to be with him in a loving relationship, but the boy gets mad at him, attacking him and some other companions. Pasolini is later beaten up, and then run over with his own car. In the days following, the press says Pasolini's murder was politically motivated by the police and those whom the poet had always loved and immortalized in his works. According to Ferrara, his plans to make a film about Pasolini have gone far back as the 1990s. Originally, the project was not meant to have been an actual biopic of Pasolini's life. Instead, it was to have starred Zoë Tamerlis Lund as "a female director living the life that Pasolini lived." However, Lund's death prevented this idea. ^ "Pasolini (18)". British Board of Film Classification. 3 August 2015. Retrieved 3 August 2015. ^ "Toronto Film Festival Lineup". Variety. Retrieved 22 July 2014. ^ Vestby, Ethan (9 December 2013). "Abel Ferrara On Artistic Freedom, Collaboration, 'Ms. 45,' Pier Paolo Pasolini & More". Retrieved 23 April 2015. This page was last edited on 23 November 2018, at 15:17 (UTC).